The Central & Eastern European Automotive Forum was organised for the 5th time by Adam Smith Conferences on 9‒10 October in Prague. 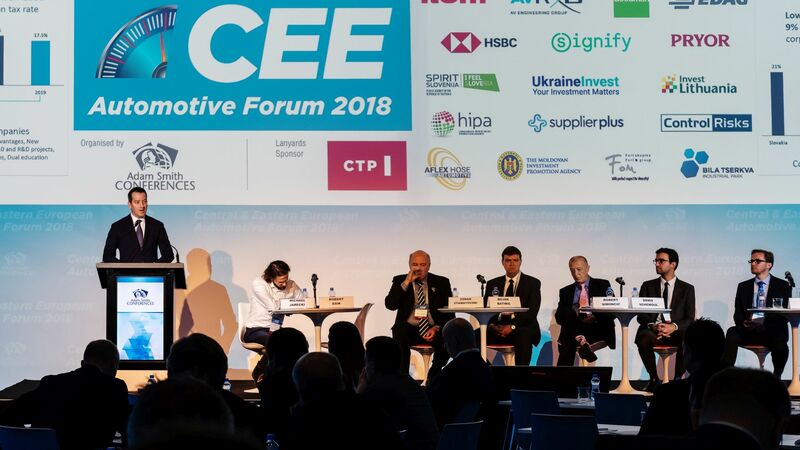 The representatives of OEMs, suppliers, investment agencies, sectoral advisory companies and service providers reconsidered the most recent challenges and opportunities of the sector with regard to this region at one of the most important automotive events of the Central European region. Róbert Ésik, President of HIPA presented major investments of the recent past, and stressed outstanding results and domestic trends of the sector, besides promoting the Hungarian vehicle industry investment environment. Furthermore, the conference was an opportunity for the representatives of the Zalaegerszeg Vehicle Industry Test Track and AVL Engineering Ltd to present the actual status of the development of the test track and possible cooperation in the spirit of “Invented in Hungary”. The B2B event linked to this event made it possible for the representatives of several Hungarian companies to meet the representatives of OEMs present in the region. The vehicle industry is still a leading sector of Hungary. Recently we saw the implementation of several development projects in Hungary. It is unprecedented in the Central and Eastern European region, but throughout the world, too, that the three German premium car manufacturers (Audi, BMW, Mercedes-Benz) that continuously give direction and set the bar higher and higher for other players of the vehicle industry are present in one and the same country. With its new plant, BMW is going to be the fifth OEM in Hungary, opening a new chapter in the history of Hungarian vehicle manufacturing, adding to long decades of success of Audi, Suzuki, Opel and Mercedes-Benz. Besides, Bosch’s second largest automotive research and development centre is located in Hungary; therefore, the developments for the European market are mainly carried out in Hungary; and the Budapest development centre of thyssenkrupp presented the self-driving vehicle developed by Hungarian engineers and the electro-mechanic “smart” steering systems in 2016. Another milestone is presented by the fact that the ADAS business branch for advanced driver assistance systems of the globally dominant German giant company Continental has chosen Hungary to build its newest research and development centre for the development of self-driving vehicles, too. These facts clearly show that the transformation of the economy from the era of “Made in Hungary” to the era of “Invented in Hungary” is not only our strategic aim but already an ongoing process. Thus, Hungary has consolidated its position in the region, particularly in the area of activities representing high value added. Nevertheless, we are not only proud of the “Invented in Hungary” but also for the “Made in Hungary” 4.0 projects, such as the ZF and the Valeo investments in Eger and Veszprém.